KOKOMO, Ind. — Mildred Stanley never had a chance for higher education, or to send any of her 10 children to college, but a scholarship in her name is helping many Indiana University Kokomo students achieve their dreams. Stanley ScholarshipThose students include Karissa Roberts who is a mother, like Mildred Stanley. "Having this scholarship is allowing me to go to college, so I can make a better life for myself and for my children," said Roberts, an education major. 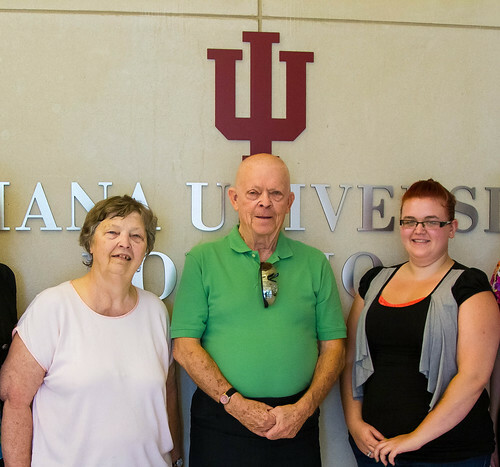 Richard Stanley, a Kokomo native who now lives in St. Petersburg, Fla., wanted to help students like Roberts when he gave $50,000 to IU Kokomo to establish the scholarship. He also wanted to honor his mother, who died just two days before his wedding. She was only 53 years old. The gift to IU Kokomo helped him cope with his anger over his mother's unexpected death, he said. "I think I had a better attitude after I set that scholarship up, which is good for me," he said. "It didn't feel good to be as angry as I was." The Mildred Stanley Scholarship awards $1,000 each year to a student who has financial need, graduated in the top 20 percent of his or her high school class, and earned at least 1000 on the SAT. Students who maintain a 3.0 GPA can have their scholarship renewed for up to four years. Roberts, from Kokomo, and freshman Austin Charlton, from Elwood, are the current recipients. Stanley, 79, gave $50,000 to endow the scholarship, money he saved during his long career at Delco. "The funny thing is, I never made $50,000 in one year," he said. "I worked for almost 30 years, and I made a habit of putting something aside in savings every paycheck, even though we lived paycheck to paycheck at first." Stanley's two surviving siblings, including his oldest sister, now 90, appreciate having this honor for their mother, and he thinks she would like it too. "I think she is looking down in heaven and smiling." For more information about opportunities to establish scholarships at IU Kokomo, contact Cathy Clearwaters, assistant director of development, at cclearwa@iuk.edu, or 765-455-9410.